Ah, a full week in London, a full inbox and an empty suitcase! I’ve spent much of this week playing catch up and editing photos from Saint Lucia, but I’m looking forward to going out and about to enjoy the Fall weather (hopefully not with an umbrella) this weekend. Saint Lucia was a stunning place, lush, vibrant, colourful. I came home with almost 3,000 photos and obviously I won’t be sharing all of them, but I’ll put up a few more posts in the coming weeks. It was an island of both extreme poverty and excess built up for tourists (who drive the majority of the economy). There were wonderfully friendly people full of excellent advice for us, some waiting to pounce on white faces with offers of boat tours and necklaces made of islands plants and others with permanent scowls on their faces. 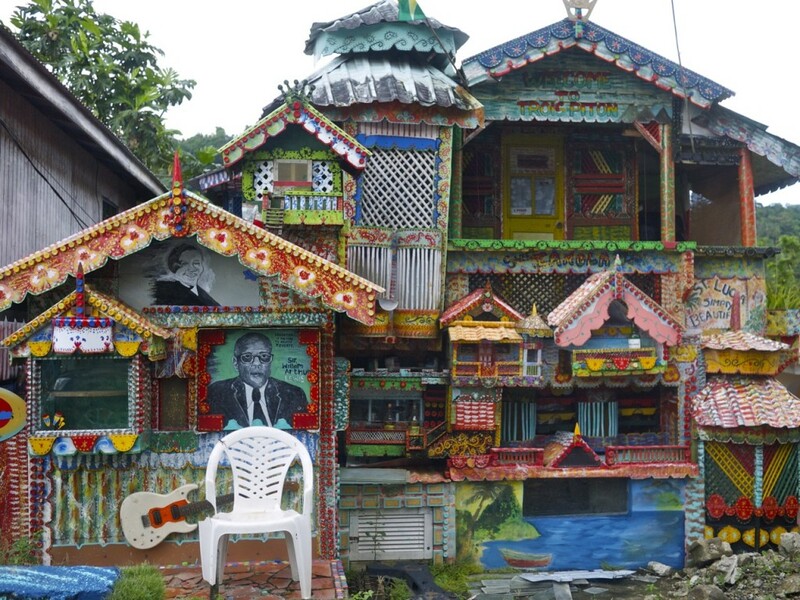 We met and spoke with a couple of locals, enjoyed a homemade breadfruit pie, saw this amazing hand painted Rasta house below, traveled up and down both coasts, stopped in crumbling villages, palm tree-lined beaches, stayed in a private villa and experienced the tourist resorts in the north. All in all, a beautifully sunny place and a much needed relaxing break from reality. What are you up to this weekend? Anyone have plans to look forward to? The New York Times has an interesting piece on what children around the world eat for breakfast. Beautiful photography too. For me these days, it’s oatmeal, but I grew up on Lucky Charms and a bowl of fruit in the morning. You? Anyone fancy a flight with Singapore Airlines Suite Class? Just $18,000 and it’s all yours for a few hours. 5 recipes to try: Cauliflower Soup with Blue Cheese and Walnut Toast; Apple, Rosemary and Sausage Stuffed Pork Tenderloin; Zora Kolac (Dawn Cake); Izy’s Swedish Chocolate Cake; and Apple Cinnamon Rolls. Have you seen Vogue’s interview series 73 Questions? I just watched Reese Witherspoon while cooking dinner and it kept me amused for a good 6 minutes. Plus, her skirt is super cute. Marieken’s round up of stamps from across the globe for World Post Day takes me back to the years of snail mail penpals. 5 fun pieces of street art: Innerfields in Hamburg, Germany; ROA in Las Vegas, Nevada, USA; Vhils in Paris, France; Vinnie in London, UK; and Stinkfish in Bristol, UK. Inspired by This has gathered images of some of the prettiest laundry rooms I’ve ever seen! Which one would you choose? Are you carving a pumpkin (or a squash…) for Halloween this year? How about some succulent hair? Would you sit down and have a coffee with each of your Facebook friends like Matt Kulesza is doing, working through 1000+? I can’t wait to hear more about your vacation in St. Lucia and see lots more photos!! I grew up on all sorts of different sugary cereals. Capn Crunch was probably my favorite. Now I either have granola and yogurt or a hardboiled egg and some toast. This weekend is Open House Chicago, so I’m off with my husband to snap some photos of buildings rarely open to the public. There’s a cool Frank Lloyd Wright house just a bit north of where we live that we want to see and the Brewster Apartments, which was in the movie Child’s Play. Should we a good time! Have a great weekend, Steph!